Validated in biomechanical testing and clinical study. Used in more than 5,000 institutions worldwide for over 20 years! All-soft, thin tapered padding. Soft enough to sleep in. Machine wash-and-dry  even at high institutional temperatures. Wont fall apart or degrade like competitive products. Breakthrough design  refined and improved in more than 10 years of development. High quality materials and processes insure the best hip protector available. Low-overhead & factory-direct pricing  for savings that really add up! All HipSaver hip protectors are a durable polycotton construction with soft pads permanently sewn in to cover each trochanter. The visco-elastic foam pads are radio-frequency sealed into a high temperature tolerant waterproof pouch. HipSaver hip protectors are soft and comfortable to increase compliance, scientifically validated and GUARANTEED to be machine wash-and-dry even in high temperatures used in institution laundries. Designed for the mobility and comfort of residents  and the convenience and peace of mind of caregivers  the HipSaver Nursing Home is a durable brief with a roomy fit for easy dressing and incontinence care. The elastic waistband and large leg openings make the HipSaver Nursing Home brief easy to pull on and off. The full, soft, fabric crotch perfectly accommodates liners or diapers. And the entire unit can be washed and dried at institution regulation temperatures (up to 250°F/121°C). Now Incontinence Management is a Snap! With QuickChange and Wrap&Snap from HipSaver. HipSaver® QuickChange Snap-down panel for a quick pad or liner change  with just two snaps! HipSaver QuickChange gives you all the features and benefits of HipSaver Nursing Home with a "snap-down" front crotch panel that allows incontinence pad/liner changes  all without having to pull the brief down. Simply unsnap the crotch panel, shift the QuickChange up on the patients waist, change the pad, liner or diaper, shift back into position and fasten the two crotch panel snaps. Perfect for changing residents, even while they are standing. Now Incontinence Management is a Snap with Wrap&Snap and QuickChange from HipSaver. Snap-on and snap-off with proven HipSaver protection! The HipSaver Wrap&Snap unsnaps completely to eliminate pull-up and pull-down dressing. Perfect for hard-to-dress residents or those who require frequent changing. And, unlike competitive products, the Wrap&Snap comes with reinforced snaps for extra durability and protective pads that are 40% larger and tapered for comfort. Best of all, with the Wrap&Snap you wont need an extra pair of hands to snap it back together! Specially designed for seniors at home and great for outpatients or those residents who reject the look of the institution models. Effective hip protection thats so discreet  its invisible! Designed for optimum style and comfort, HipSaver SlimFit delivers superior protection that "disappears" under most clothing. Made of light-stretch, polycotton with form-fitting Lycra, HipSaver SlimFit looks good, feels good  and pulls on just like regular underwear. Its lightweight and flexible enough for walking, golf, tennis, skiing and other sports  and comfortable enough for everyday wear! Best of all, HipSaver SlimFit actually protects hips better than bulky or hard-shell protectors. So its ideal for fashion-conscious and active elders who are at risk of hip fracture, but reject uncomfortable and obvious hip protection products. "I had heard that hip protectors were uncomfortable, but not HipSavers. I put them on when I go out and feel safe. I've shown them to all the members of my osteoporosis group." NEW! Open crotch design for easy toileting. The HipSaver Open-Bottom can be put on once and left on all day and all night. The totally open crotch allows the wearer to use the toilet without having to pull the HipSaver down. Its the perfect hip protector for those who may need to suddenly and quickly use the toilet  no fumbling! The sleek brief design allows the HipSaver Open-Bottom to fit nicely under regular residents underwear or can be worn alone. The new HipSaver Open Bottom 3- Snap is the perfect solution to make it easy to change incontinence products while reducing soiling of the HipSaver. While the original HipSaver Open-Bottom works great for residents who are self-toileting, the new HipSaver Open Bottom 3-Snap is worn OVER incontinence products. With just 3 snaps, incontinence products can be changed quickly. And because the crotch area is totally open, there is less chance of soiling the HipSaver. With less soiling you wont have to change the HipSaver as often. Help for those with weakened grip-strength. Make HipSaver protection easier than ever for residents who dress themselves. Add new HipSaver EZ Pull-up Handles to any HipSaver SlimFit or Nursing Home model and give the wearer easy-to-grasp handles for opening and pulling the brief up. Designed for residents without the grip-strength to grab a waistband, EZ Pull-up Handles are just what many residents need to be able to continue to dress themselves. Add EZ Pull-up Handles to any HipSaver SlimFit or Nursing Home model. XS Extra Small 28" - 31"
S Small 32" - 35"
M Medium 36" - 39"
L Large 40" - 44"
XL Extra Large 45" - 50"
XXL Extra Extra Large 51" - 57"
HipSaver accepts MasterCard and VISA. If you wish to pay by check, call for a handy order form. While HipSaver has achieved excellent and impressive results, no product can claim to be 100% effective all of the time. 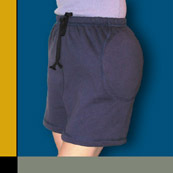 Therefore HipSaver, Inc. makes no implied or express guarantee that its product will prevent injury. Proven fall protection in comfortable Sweat Pants. Shown here with hip and tailbone protection. Tailbone padding protects against painful injuries to the coccyx. Available with hip pads or hip and tailbone pads. HipSaver, the Leader in Hip Protection, introduces SoftSweats  soft, fleece-lined sweatpants with genuine HipSaver protection. HipSaver SoftSweats come in 3 colors and a full range of sizes and lengths to fit both men and women perfectly. For over 9 years, HipSaver Hip Protector Underwear has set the standard for hip protectors. Only HipSaver offers you the comfort of skin-friendly, soft pads, the convenience of sewn-in pads, the variety of models to meet the needs of residents and caregivers and the quality and durability to stand up to tough nursing home conditions. All HipSavers, including SoftSweats are guaranteed to be machine wash-and-dry even in institution laundries. And best of all HipSaver protection is PROVEN, in University biomechanical testing, and published clinical trials. Use this guide to choose the HipSaver hip protector model that best fits your residents needs. Unfasten 2 snaps, crotch drops down, QuickChange is shifted up on to residents waist, incontinence pad or liner is changed, shift QuickChange back into position, re-fasten 2 snaps. 8 snaps, completely opens like a diaper, good for larger/difficult to dress residents and those who need the hip protector changed at the same time as the diaper. Pull up and down over incontinence product, good for those who dress themselves, and/or self-toilet, wide leg holes make for easy dressing. Available with EZ Pull-up Handles. Easy to pull up and down, wide leg holes allow easy dressing, and male fly front option. Can also accommodate incontinence product. Easy to pull up and down, wide leg holes allow easy dressing, can also accommodate incontinence product. Designed to be discreet under clothing, sleek design most resembles regular briefs. Perfect for the fashion-conscious wearer, sleek design is discreet under most clothing. Totally open crotch allows the wearer to use the toilet without having to pull the HipSaver down. High risk factors include: Osteoporosis, impairment of gait or balance, orthostatic hypotension, Positive fall history, History of fracture, presence of Neuromusular disease (Parkinsons, CVA, dementia), generalized weakness, multiple chronic diseases or conditions, medications, dizziness, reduced vision or hearing. Determine which HipSaver model is best suited for each resident. Considerations: Male/female, toileting ability/degree of continence or incontinence, amount of help needed for dressing, likelihood of backward fall, degree of manual dexterity. Measure around the widest part of the residents hip. Use the chart on this page to determine the correct size. The recommended minimum is 4 per resident. Consult with laundry regarding wash cycles. Consider how long it will take for the HipSaver to be returned from the laundry. Residents should wear HipSavers all day, every day and while sleeping. Falls can occur at any time. HipSaver hip protectors are designed to position a cushioning pad over the hip bone (trochanter). Here is how to determine the location of the hip bone. The hip bone is actually the top of the thigh bone and is shaped similar to a small light bulb. You can feel this bony ball by placing your fingertips on the side of the hip and while raising the knee slightly, noting the movement of the underlying bone. This is not to be confused with the pelvic bone which is higher, more toward the front and does not move when the knee is raised. Fit should be snug to insure proper pad placement. Label the HipSaver with the residents name. Educate residents and family about serious consequences of hip fracture, note that wearing HipSavers may allow less restraint, more freedom to move about. Demonstrate the softness and comfort of HipSavers. Encourage uninterrupted wear, even while sleeping. Add "HipSaver Wearer" to treatment chart or use the free "HipSaver Wearer" labels available from HipSaver. Keep records of all falls and any injuries. E-mail us at hipsavers@msn.com or call HipSaver toll-free at 1-800-358-4477 for answers to your questions or to discuss any issues. HipSaver is proven in both biomechanical testing and clinical studies. HipSavers biomechanical test results from 2 prestigious Universities are superior to hard shell hip protectors. A two-year published study reported a zero percent fracture rate in 199 falls of high risk elderly individuals. A 13-month long study also using HipSavers reported a 93% compliance rate and no hip fractures in 126 falls. When evaluating a hip protector, be sure that testing is executed by professional University staff representatives using clinically accepted protocols. Also, ask for copies of clinical studies to ascertain that the studies cited refer to that specific brand and not hip protectors in general. HipSaver pads are all soft, thin and tapered  designed for maximum comfort to increase compliance rates while offering proven protection. Six sizes ensure proper fit. HipSavers sewn-in pads are more convenient. Sewn-in pads cant get lost during laundering or be removed by residents. Sewn-in pads are more cost effective  which reduce labor time inserting and removing. "When used in institutions, it is recommended that the hip protector shields are sewn into the underwear to reduce staff effort and time." HipSavers have been used around the world in thousands of nursing homes, Veterans Hospitals, and elder communities for over 9 years. The record shows their effectiveness, durability and high compliance rate. HipSaver is the first hip protector to encapsulate soft padding in an airtight, waterproof pouch. Beware of look-alike products that use inferior materials. Only HipSaver offers the greatest range of adaptive styles and models. HipSaver is constantly testing new innovations to add to the HipSaver product line.